Visual Management is a business technique which allows important information to be communicated through the use of visual signals instead of texts or other written instructions. Visual Management tools allow you to communicate information to your teams visually which saves time, effort, and money. Controlling your workplace visually puts targets or goals on display and allows everyone on the team access to add or offer ideas and solve problems. Visual control creates clarity within teams and helps focus on continuous improvement operations. Indigo creates visual management products which are easy to understand, simple to use, interactive & functional specifically to your team and process. What are Indigo Visual Management products? For business managers who want to get the most from their team and their process, Indigo creates visual management products such as whiteboards with interactive tooling which are easy to understand, simple to use, interactive & functional at the same time. 100% dedication to innovation around quality Visual Management products and visual solutions. Visual management is a necessity when working with “Lean process” and with companies investing in this form of business the demand is growing. We have many years of experience working with multinationals and so we have lots of tried and tested products to offer. Throughout our business we base everything we do on Quality & Customer Service. The essence of what we do which is the real time visual information and active engagement between management and team creating a collaborated process. All our products are interactive whether they are a visual management board or visual indicator tools we create. These combined allow the continuous improvement through team collaboration. 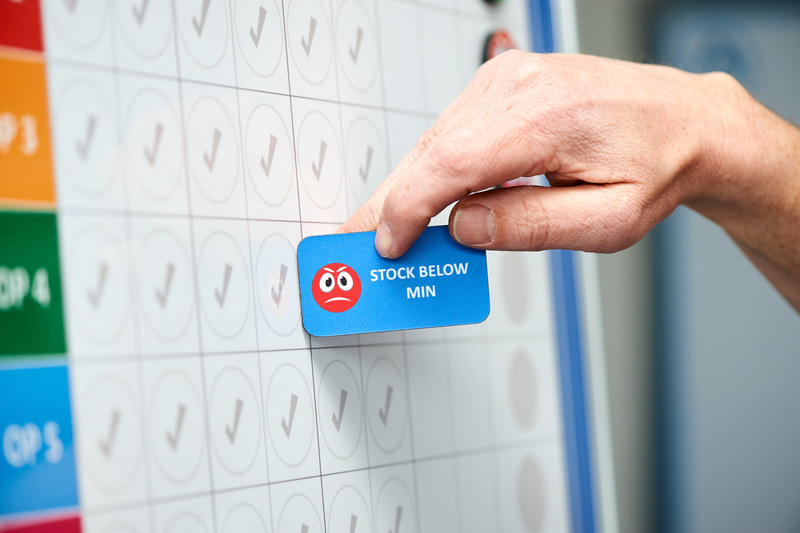 A unique part of our of our wipeable products is that one can use a permanent marker to write information on a task magnet for example, this then can be moved from A to B on a board. The ink does not rub off until it is needed to be cleaned, at which point we offer an ink cleaner that restores the wipeable area to a crisp clean new face. At any one point in the day management can walk up to our boards and see WIP and if there are any roadblocks ahead. From the team members point of view they are highly involved in their process, understand the plan and feel rewarded for achieving measurements and tackling issues. A move in culture: In the past we have transformed businesses to think visually. Customers move to show collaborated culture through visual management service combined with interior design – subconsciously embedded teamwork and company values. All added to the value of the process. Visual in All Areas of your business: Visual management products can be applied to all areas of your business from manufacturing areas to finance, HR areas etc. Lean is about working together to continuously improve your business operations which saves time, effort, and money. Lean helps you and your team ensure your customers get what they want, when they want it, on time, every time. Where Are You On Your Lean Journey? Are you are starting out on your lean journey & need help with how to plan your visual management? We show you the capabilities of our visual management products while keeping it simple yet effective all based on your own operations. Maybe you have your eyes on the Shingo prize we can offer visual management products that suit your business and its process best. We understand the importance of creating world class visuals in order to achieve business excellence. Things You Might Need On Your Lean Journey? Who Can Use Visual Management? At Indigo we make lean visual management products work best for you! From concept to development we collaborate with you on design thinking your process resulting in creative custom visual management displays accompanied with interactive products that allows for team engagement. Along the way we offer expert guidance, quality design & visual product creation specific to your business.